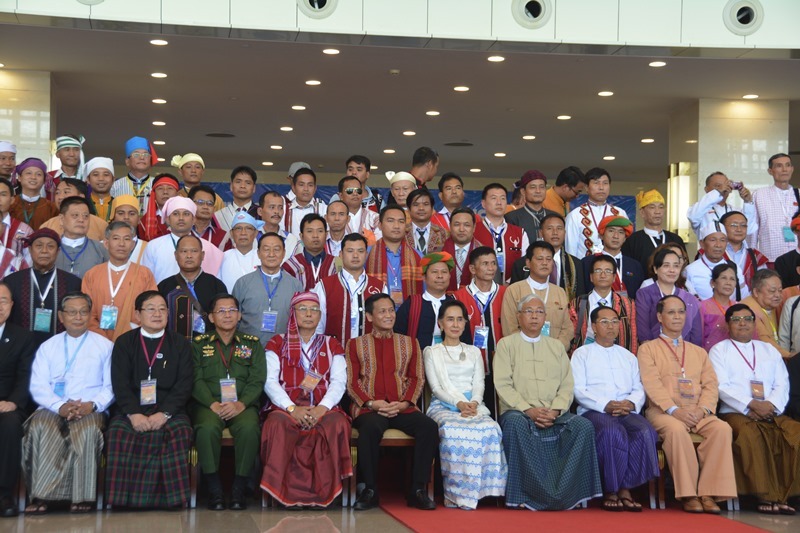 Participants gather for a photo during the 21st-Century Panglong Peace Conference on August 31, 2016 in Naypyidaw, Myanmar. Source: Paul Vrieze, used with permission, all rights reserved. When Myanmar foreign minister and state counselor Aung San Suu Kyi arrives in Washington on September 14, she is due to focus on gaining U.S. support for her country’s economic development, possibly through adjusting longstanding trade sanctions against the impoverished, former junta state. Attention will no doubt also turn to the country’s democratic transition, ethnic conflict, and inter-communal tensions. In her meetings with President Obama, top officials and lawmakers, Myanmar’s de facto leader will be able to inform them of some significant recent steps taken by her young National League for Democracy (NLD) government –- including a surprise decision to allow former UN secretary-general Kofi Annan to lead an advisory commission, comprising three foreign members, three local Buddhist and three local Muslims, for a year-long inquiry into the Rakhine State crisis. The decision is seen as a serious attempt to deal with the unpopular issue. For Myanmar’s long-term political future, ending the seven-decades-old civil war will be more important, however, and the NLD government has wasted little time in revamping the peace process of its nominally civilian predecessor. Aung San Suu Kyi accepted the peace process roadmap and negotiating mechanisms of former president Thein Sein, while publicly committing to an all-inclusive process and the creation of a democratic federal union that would grant ethnic groups the autonomy that they have long demanded. Her government’s first peace conference, the 21st-Century Panglong Peace Conference, took place on August 31 amid much media attention. It brought together 18 ethnic armed groups, the military’s powerful leadership, and hundreds of political party members and lawmakers. The event was highly inclusive, yet largely ceremonial as it lacked discussions and representatives only gave speeches to explain their vision for a federal union. After this grand event, much hard work now awaits the NLD government. It wants to hold a more substantive peace conference in six months, but prior to the event it needs to bring an additional seven ethnic groups onboard to the Nationwide Ceasefire Accord. Eight groups already signed the accord last year, but the others (including the Kachin Independence Army fighting in northern Myanmar) declined as they distrusted the previous government of former generals. They also rejected the army’s demand that three rebel groups would be excluded from the accord. The non-signatory groups now hope Aung San Suu Kyi’s strong political mandate will help her persuade the army to let all groups join, while also getting it to agree to the conditions for a multi-year dialogue over Myanmar’s political future. Her administration will have to iron out differences between the government, ethnic groups, and the military over the dialogue’s conditions, such as its decision-making rules, agenda, and how the peace process bodies are constituted. The subsequent political dialogue could ultimately lead to a comprehensive peace accord and will have to include the difficult issue of amending Myanmar’s constitution. The army-drafted charter is loathed by ethnic groups as it ensures central government control over their states, while the NLD objects to clauses that give the military extensive political powers and a quarter of parliament seats. The latter clause also grants the army a veto over constitutional change. There is cause for some optimism since Aung San Suu Kyi appears to have established a functioning working relationship with the army’s commander-in-chief Min Aung Hlaing. A total of 21 ethnic groups are expected to ultimately join the peace accord and another challenge will be to persuade several powerful groups, most importantly the 20,000-strong United Wa State Army, to join the discussions. The Wa are now outside the peace process and enjoy the benefits of a longstanding bilateral ceasefire. Experiences at the recent NLD-led conference indicates that there are plenty of hurdles ahead. Several ethnic leaders voiced discontent over the NLD’s lack of consultation over the conference agenda, while an error by conference organizers resulted in the Wa delegation being handed “observer passes” instead of participant status. Irked by the perceived slight, the Wa delegation walked out without giving a speech. More worryingly perhaps, the military insisted on excluding ethnic Ta’ang, Kokang, and Rakhine groups from the conference as they refused to publicly commit to ending their armed struggle. The groups are engaged in near daily clashes in northern Myanmar that continue to displace civilians. In the days leading up to the conference attacks on the groups and the Kachin rebels intensified. In a further sign of difficulties ahead, the army chief and another top commander, in their conference statements, made no mention of the army’s support for constitutional change and said the charter already supports federalism. Some conference participants said that, nonetheless, they were cautiously optimistic that the military would continue to participate in the NLD-led peace process, noting that throughout the democratic transition it never committed to constitutional change, yet has kept making concessions. “In every meeting and every peace conference they (the military) defend the 2008 constitution, that is the last thing they hold on to. But the (peace) process is still going step by step,” said Sai Kyaw Nyunt, a Shan National League for Democracy member and a political party representative on a peace process committee. “It shows that the process is coming and they have to accept it later on,” he said. Mr. Paul Vrieze is a journalist based in Yangon, Myanmar. Follow him on twitter @Paul_Vrieze.